After years of discarding female babies in favor of boys, men now out populate women 5 to 1. Thus making women the more valuable gender, choosing husbands who will be the most likely to carry on the female gene through a series of tests. Told in alternating voices, Sudasa, in verse, and Kiran, in prose, are forced to participate in these tests, not knowing they have the same agenda. To defy the system and leave this backward society behind. Rife with many great discussion points, 5 to 1 is perfect for book clubs. Of course, you don't have to be in a book club to enjoy this beautiful debut. 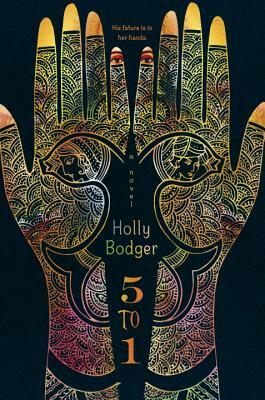 Holly Bodger has a BA in English literature and has spent her entire career in publishing. She is an active member of Romance Writers of America and is a 2013 Golden Heart finalist in the Young Adult category. She lives in Ottawa, Canada.